On loan to Hillsborough Castle, County Down, Northern Ireland. 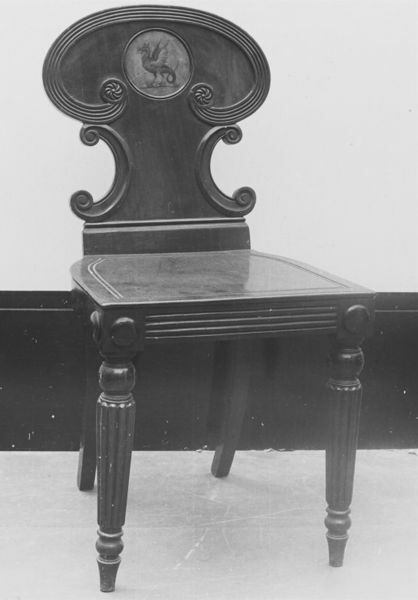 Hall chairs, a pair. Mahogany. The back of scimitar form, supported by "C" scrolls, enclosing a roundel with a painted crest of a wyvern. Mahogany seat supported at the rear by plain, backward-curving, and at the front by round, tapering, reeded, legs. Wooden studs at the front corners. Bequeathed by Lady Henriques, the acquisition recorded on Nominal File MA/1/H1634. 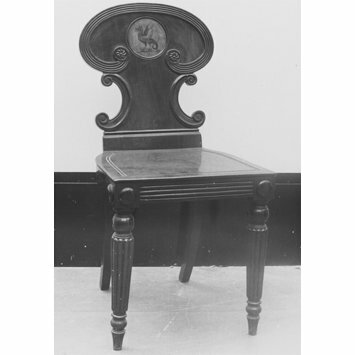 The hall chairs came from 37 Eaton Square, London, where Lady Henriques had a collection of furniture made between 1790 and 1820, including a number of pieces in satinwood. She was the widow of Sir Philip Gutterez Henriques (1867-1950), a barrister and civil servant. Their only son, Philip, was killed in action in 1815, and from 1930, Lady Henriques had been seeking to make bequests to the Ashmolean Museum, Oxford and the V&A of pieces from her collection.